Today's Feel Good Friday is focused on girls! Why? Because it's still Women's History Month and we're celebrating women of all ages and the people who love them. Speaking of women we love, let's talk about Amy Poehler. Whether you watched her on Saturday Night Live or became a fan of Parks and Recreation here's another reason to invite her to become your new BFF. She, along with Meredith Walker and Amy Miles, founded Amy Poehler's Smart Girls, an organization "dedicated to helping young people cultivate their authentic selves". Their motto is "change the world by being yourself"! They have a variety of shows online including Modern Manners, Book Report, Boys Minute (featuring many of the boys from P&R, Girls of the World, (a great way to learn about other cultures) and Ask Amy (a show where people send in questions and Amy answers them in a short video). In addition to all the video content, there's an entire take action page sorted by topic. If you don't have a specific topic you want to learn more about, you can just pop by to read interesting, inspiring articles like this one on the women of Hamilton. As they explain in the about us section of their site, "We celebrate curiosity over gossip. We are a place where people can truly be their weird and wonderful selves." So take your weird, wonderful self over to their site for a visit. 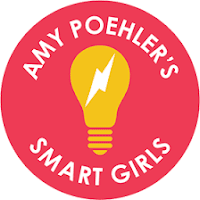 Watch some videos, send the link to a young girl in your life and stay in the loop by liking their Facebook page and following them on Twitter @smrtgrls!